How to make rock bugs and spiders. 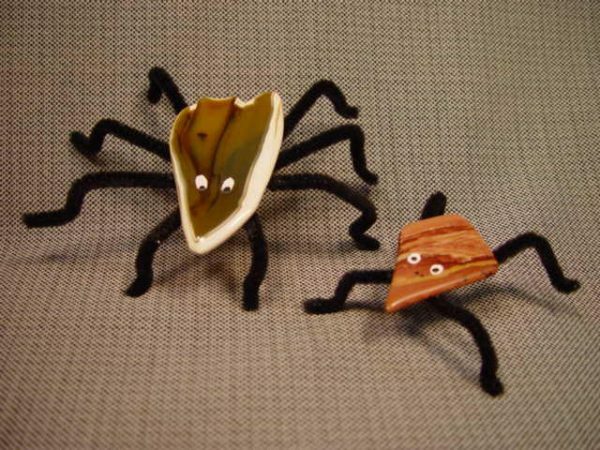 How to make rock bugs and spiders will come in handy for cute gifts for children of all ages. You will need some tumbled stones, pipe stem cleaners or “Chenille Stems” from a craft store, glue (a multi-purpose cement such as Bond 527) small bottle of white and black acrylic paint, and toothpicks. Using the white acrylic paint and a toothpick, paint the white of the eyes on the stones. The acrylic paint will take about 30 minutes to dry. When the paint is dry, use the black paint to paint the pupil of the eye. Paint the pupils in the center of the white, or to the right side, or the left side, or close together for a crazy looking set of eyes. (If you make a mistake, use fingernail polish remover and start over.) If you prefer, those cute wiggly eyes may be used, but tend to fall off easily with handling. The legs for the spider will number eight so use two of the chenille stems, cut them in half. Gather up these four pieces and twist the wire in the center about three twists. The bugs will end up with four legs so use only one stem and cut it in half and then twist the two pieces in the center at least three times.) Bend the ends of the stems to simulate feet. The gluing is the last step. Place the tumbled stone on the center of the stems where the twist is located and estimate where the glue needs to be applied so that the stems and stone will be glued together, without having glue exposed. Apply the glue to this area and center the stone and set upright so that the weight of the stone will help the glue adhere to the stone and the stem legs. Complete drying takes 2 – 24 hours. Great for kids, grandkids, fund raiser at the rock show and more. 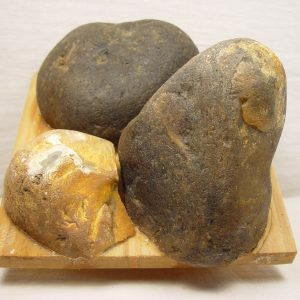 See the link shown below if you are in a rush to purchase some rock spiders ready to go.